Have you seen the joy a 3D printer can bring to children when they witness their objects come to life? Every child deserves to experience this emotion at least once in their childhood. 3D printing is being adopted by many industries today than you could imagine. For example, the architecture industry uses it in creating airplanes. In the design field, the printing is commonly used to create prototypes to present to clients. Home-based users i.e. hobbyists or those that simply want to explore the new technology are using 3D printing for a wide range of applications. Bringing the 3D printing experience to schools is therefore very important to help children to stay updated on the latest technological advancements. Educating children when they are young to use a 3D printer gives them more career options to explore later in their life. As fate would have it, more 3D printers are entering classrooms all over the world. The machine not only brings fun to the future engineers but also supports subjects like biology. Creativity is greatly encouraged by 3D printers as they take your children’s ideas from the paper in front of them to a real-life object in just a few hours. Educators can use 3D printers to manufacture educational tools instead of spending money to buy them. For instances, teachers can simply print educational aids and save the school money for something else. Although a 3D printer is a great learning tool, you should not spend a lot of time looking around the internet to download models that your students have to spend hours watching them print. Instead, try to do something that is already in the school curriculum. Also, try to get the kids to mold the final object as much as they possibly could before you print it. Below is a list of the ideas you can implement to help your students understand 3D printing better and become more enthusiastic about the technology. This subject is mostly theory-orientated because teachers simply don’t have the time to build real models for their students or have them do it themselves. Moreover, create a model solution in real life would probably be expensive to pull off. However, this changes with 3D printing on the scene. There are many engineering concepts you can get your students to understand using 3D printing technology. You may use some models available online or ask your students to improve the designs before you print them. It will be better to get your students to work in groups when it comes to 3D printing. A good example of a project you can consider is building a bridge with your students. In their groups, they can discuss and try to come up with the best solution of a bridge that might be deployed over something like a river. You can make math more relevant to your students by printing the things they are learning about. This might be something like percentages that comes from the result of a math problem or simply everyday factions. Printing shapes is also an interesting way of teaching your students about them. You can use the physical object to explain the theory behind them. There are many anatomic models that you can download online and print. If you are teaching about different life forms, you can find an organism you want to study and print it. This physical organism will help your learners better understand its structure and at the same time, show off the more practical application of the theory they learn in class. In the art and design industry, 3D printing is no stranger. In the past few years, the technology has become mainstream in these industries compared to the others. A 3D printer is very flexible in terms of what it can do and therefore, can be used to further encourage creativity amongst children. At first, you might think that it’s odd to use a 3D printer in a history class. However, this is not true. Your class can benefit from a rich historical experience through the artifacts that you print in class. This means that students can be more hands-on with history compared to just studying the theory. Young children can benefit a lot from shapes and 3D alphabet letters or even numbers. These learning aids give the students a hands-on experience with the theoretical work they are studying. You can also involve the older students by getting them to help design and print these learning aids for young students. The most important thing about having a 3D printer at your school would be to teach students more about 3D printing technology. The printer’s core functions. They need to understand the underlying controls and mechanics that need to be used to produce good quality 3D prints. Various controls on your 3D printer. Teach your student the key features of the specific 3D printer you have and what would be ideal for them. Your students will learn fast about the mechanical components of a 3D printer. It is easier for them to absorb this information when they are present while these components move around right before them in an open design. Advanced students can play around with the settings of your 3D printer. For example, they can test the influence of using different temperatures and extrusion rates on the quality prints they receive. Now that you’ve seen how much your college or school can benefit from a 3D printer it is time to look at the features to consider when buying a 3D printer. There are a few attributes you will have to consider when you buying a 3D printing machine for your class. Buying a classroom 3D printer is very similar to buying a home printer. However, you might need you might need to closely consider the following factors so that you can make the best decision. There are a few 3D printers on the market today that do not require much initial setup. With these printers, you can simply take them out of their packaging or box, load some filament and start printing. You won’t be bothered to turn a nut or bold here and there into place. However, majority of 3D printers require some initial setup. These printers range from the home DIY kits to budget-friendly options. The printers are affordable and hence you will save a lot of money if you buy them. However, it might take you days to actually get them up and running. This best classroom 3D printer review article will only focus on printers that do not require a lot of setup besides plugging them in to get started with printing. The 3D printing process has significantly increased over the past few years. However, this doesn’t mean that you can’t leave your printer unattended overnight sometimes. The only frustrating thing that can come out of this is a failed print after long hours of waiting. The best 3D printers are made with the highest quality components that enable them to produce reliable results consistently. The printers also use high-quality filament brands. Unfortunately, you might not be able to complete 3D prints in your class time. Even though 3D printers are fast, they might still consume an hour of your time to print something small. Some printers are just too slow and would rather be avoided for the classroom. The last thing you’d want is a printer that takes a few days to complete your print. With the printers mentioned in this article, you can tweak the hardware and software to improve their performance. Whether you are aiming for fast speed or high quality, these machines offer the best of both worlds. When using a 3D printer for industrial, it is very important to pay attention to the details. If you are using it in class, the level of detail may not be much of a concern. Children are often more excited about their creations that are coming alive than the level of detail of their objects. If you need something that is more mechanically orientated, invest in a 3D printer that gives you that level of quality. A printer’s build volume refers to the biggest object a printer could possibly print. In theory, this is a more triangular-shaped model. Although you might be attracted to buying ya printer with a big build volume, it is better to settle for one that doesn’t. Many 3D printer users, including commercial users, split their object into several smaller pieces and later glue them all together to save time. Keep in mind that children’s boundaries are often what you tell them. If they are aware that the printer has a big build volume, they might design prints that fit into that volume. The downside to this is having to wait long hours for your build to finish. This will also finish your filament faster than you might have wished. Most 3D printers print a material named PLA. This material is biodegradable because it comes from a natural plant and produces nontoxic fumes. PLA is the best printing material that should be used in the classroom. The nontoxic smell makes it perfect for this purpose. Another great material to print with is ABS. Unfortunately, this material is not as friendly as PLA. ABS gives off lethal fumes that can lead to series health issues. If you are printing with ABS in the classroom, ensure there is good ventilation and keep children off from reaching the printer while it’s printing. The quality of printers has risen as the cost of printers has been dropping over the past few years. Therefore, you wouldn’t find it too difficult to get the printer that is just right for your budget. There are a few compromises that you’ll have to make when buying a budget-friendly 3D printer. However, this is understandable as is the case with buying most budget-friendly products. The best way of giving your students is rich experience is by exposing them to different 3D printers. This means that more students will be able to directly interact with a 3D printer. They will also become more comfortable around 3D printers and enthusiastic about the whole printing process. You can even make a little profit out of this. Simply set-up your own lab where you charge public members to make use of your 3D printing machines. Dremel has designed a 3D printing package that works perfectly for K-12 classrooms. The package was designed to be used with the Dremel 3D40 printer. This is a user-friendly 3D printer that provides repeatable and reliable results. Inside the package are helpful bits that will get your first 3D printing lesson off to a smooth start and as soon as possible. The guide not only educates you about the printer but also has study materials to improve your skills. Thanks to the Dremel 3D printing package, you can get the fundamentals related to 3D printing faster and be more confident when you enter the classroom. This printer is designed to be both safe and easy to use in an environment such as the classroom. The printer can only be used with the proprietary PLA filament from Dremel. Therefore, you won’t have to worry about getting the wrong brand filament or creating a mess when you do so. The Dremel machine has a build volume of 10″ x 6″ x 6.7″. The build plate enables you to take your prints of the plate outside of the printer, preventing you from damaging the insides of your 3D printer. The integrated “Quick Level” system makes it easy to set up the 3D40 printer. Simply follow the icons on the screen to get through the bed leveling process. The printer will give you clear instructions on the notches to turn and also how much. In a classroom environment, you will easily find some volunteers to help with this task. Dremel has worked extra hard to ensure that this printer has a clog-resistant extruder. Therefore, you can print without worrying about clogging, which is a major reason for 3D print failures. The company behind the 3D40, Dremel, is no stranger to household consumers. The reputation gets even stronger with this reliable 3D printer. Consumers report that Dremel one of the best 3D printing manufacturers in terms of customer service. Whether you contact them on the phone or through their online channel, they are very responsive. Dremel Print Studio is an online platform you can use to design your models. Besides choosing amongst the various models that are already on the platform, you can upload your own designs from students. These designs can come from any CAD program like, for example, TinkerCAD. This printer has multiple connection options for uploading your virtual models, including Wi-Fi, SD-card, Ethernet, and USB. If you want to start your prints during a lesson, you can do so because the printer is not noisy. Its driver system is designed to keep the travel amount low, which reduces the amount of noise produced. In terms of layers height, you will get something around 100 microns. This is fine for classroom applications and should still give you smooth finished models. If you increase the speed, you can achieve layer heights of 200 to 300 microns. Generally, the printer quality should not be something to feel bothered about because you’ll have excellent prints. You can read the full review of the Dremel 3D40 here. The Dremel 3D printer comes with some filament in the box. You’ll have 4 PLA filaments of different colors to start off with. To put the amount of PLA in perspective you’ll be able to print around 100 iPhone cases using just one roll of PLA filament. The package also comes with a reasonable amount of build tape. The tape is primarily used to ensure that the first layer of your model sticks on the building plate. If this is not done properly, your model may move around during the printing process and result in failed builds. Lastly, you will receive a second build plate in the box. You can use the plate to reduce the time your printer has to sit on idle. In other words, once one print has finished, you can insert the second build plate and start printing the next object right away. In the meanwhile, your students can remove the first print from the build plate and do all the necessary tidying up that is needed for the model. Dremel knows that there will be some trial and error during the first printing tries and this is why they include these materials in the box. The 3D40 printer has 30 lessons that come on a USB stick. These lessons are geared towards different audiences, ranging from grade 3 elementary school all the way to grade 12 in high school. Each lessons has a 3D model accompanying it. Therefore, students can modify and interact with a model before it is sent to the printer. 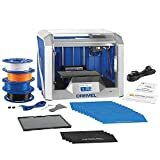 The Dremel 2D printer is the best when it comes to bundled 3D printer lesson packages. As an educator, you will find it easy to learn 3D printing all by yourself using the lessons. Every lesson is structured perfectly to be used in the classroom. Apart from the included lessons, you will not find any problems in terms of the reliability and quality of your 3D models. The Ultimaker 2+ stands out for its amazing build quality. Not only does it look like a professional machine but it also feels like one. Amongst the FDM 3D printers on the market, the Ultimaker 2+ provides the most impressing results. You won’t have much to do when it comes to the setup process. The bed will automatically calibrate when you follow the simple instructions on screen. After finishing the calibration process, you won’t be required to do it anytime soon thereafter. The printer’s reliability really stands out. The build quality will catch your eye from the initial unboxing process and even when in someone’s office. It’s just that good. The components packed inside are of the highest quality. The Ultimaker 2 also has twin cooling system that is aimed at the hottend and its chassis is closed on all four sides. This enclosed environment contributes to more successful prints. Ultimaker is very responsive in their online community. From these responses, it has become evident that you can trust the UM2+ to provide you repeatable reliable prints. The printer has various connections options, including Wi-Fi, USB, and Ethernet. With all these options, loading your files to the printer will be a breeze. Whether you are in the printer’s room or want to connect remotely, the Ultimaker 2+ provides a smooth connection experience. Cura comes included with this printer. This application is user-friendly and easy to use, even for beginners. You can start the printing process using the optimal settings by simply pressing “GO”. If the basic optimal settings are not enough for you, choose the more advanced settings. There are hundreds of settings that can be tweaked to give different results. The Ultimaker’s built-in webcam allows you to monitor your prints through Wi-Fi remotely. You can benefit most from this when you want to finish a print while the printer is in another room. This printer allows you to print objects up to 8.5″ x 8.5″ x 7.9″ in size. This is the average build size of FDM printers. However, the size should not limit what you can achieve with the printer in the classroom. The top part of this printer is open. Therefore, if you plan to print ABS with it, there might be some complications because the filament requires a fully enclosed environment. The best you can do with this printer is to use CPE filament when you require something tougher than PLA to build your models. CPE is also a nontoxic filament making it ideal for the classroom. Ultimaker’s 2+ will exceed your expectations with the quality of prints. You will barely notice any build layers when you switch the printer to the highest print quality setting. The print resolution of this machine comes in an impressive range of 20 -200 microns. Printing at such high resolutions often leads to slow printing time. However, the Ultimaker printer has four nozzles of varying sizes for speeding up the printing process when the printer is set on a low resolution. The UM2+ uses 3mm filament. Ultimaker includes an NFC tag on their filament that informs the printer about the color and type of filament you insert into it. The manufacturer does not tie you to only use their proprietary filament. You can use other good quality brands out there. This machine will allow you to print CPE, ABS, Nylon and bunch of other materials. CPE is the new kid on the block that is ideal for classroom use. Although it has similar durability and strength properties like ABS, it does not give off toxic fumes like ABS does. CPE would be ideal if you have to create a model that needs structural integrity or requires chemical resistance. There is a tougher version of CPE called CPE+. This filament is ten times stronger than regular CPE and is temperature resistant to 100°C. The Ultimaker 2+ 3D printer offers a great experience can also run fully automated. The flexibility you get with this machine exceeds what you get from many of its rivals. You can rely on this printer for reliable prints every time. Even if you haven’t touched a 3D printer before, you will find the machine easy to use because of its user-friendly design. The printer is designed to save you time on tinkering with it and allow you more time to educate your students. The UM2+ is good to use at any level of schooling because it can use different types of filament types. If your older students get bored with using the one filament type the printer comes with, they can switch over and experiment with some of the other supported filament types. This printer can anywhere it goes. Whether it’s your school department, home office or even a design business, the Ultimaker 2+ does the job without any hiccups. This is one of the most advanced 3D printers on the market that allows you to use the type of filament and software you prefer. Hundreds of colleges, schools, and libraries are already using this printer. LulzBot’s TAZ6 is one of the larger 3D printers on the market today. The build volume is generous at 11″ x 11″ x 9.8″. A bigger build volume also means that you will be able to print more than one object simultaneously. Unfortunately, you won’t go through the setup process as quickly as you might think. You will have to initially assemble the printer in around one hour. However, if you are unfamiliar with a 3D printer, you may take a little bit longer to accomplish this task. The printer comes with clear and easy to understand instructions. Lulzbot also tried to make the required manual steps as easy as possible. There is a guide tube that allows you to feed some filament to the extruder. Once you get the gist of how things are done, it should really become easy. However, some competing printers make the process fully automated, not manual like Lulzbot is. You don’t have to worry much about print bed leveling because the process is fully automated. This saves a lot of time in a fast-paced environment like the school classroom. Even though there may be some reliability problems with this printer, they are never major. There are few reports of failed builds and malfunctions of the machine even after using it for thousands of hours. There are several features packed into this printer that allows it to have successful builds. One of these features is the fully automated bed leveling process. Another awesome feature is the felt pad which cleans your extruder’s tip before printing each model. The felt pad removes the excess filament that might have been extruded at the end of the previous print to prevent it from spoiling the next model to be printed. With two of the most common print failure reasons out of the way, you should almost never get a failed build when using the Lulzbot TAZ6. The amount of filament that this machine can print is impressive, to say the least. This is because its extruder can heat up to 572°F. You won’t break a sweat when printing materials like ABS and PLA or even an exotic filament blend. The printer’s acceptable filament size is around the industry average of 3mm. With the printer, you can use filaments from your preferred brand. Lulzbot ships their own software with the printer. The software is very much similar to Cura. Lulzbot’s version of Cura allows you to run a fully automated printing process. This helps beginners and students. If you are an advanced user, you can jump into the advances printing settings menu where you can tweak almost anything on the printer. You can connect to the printer through its two connection options, i.e. SD card slot and USB. After a print is finished, you can use any of these channels to transfer it to the printer. You may start and stop a print at any time you’d like through the LCD display on the printer. The screen also shows the amount of progress and if the printer is still in use. The open design of this printer makes it a little nosier than fully enclosed computers. Avoid using this printer in a smaller room as the noise can be very distracting. The objects produced by this printer are of good quality. You’ll barely see any spider webs on your prints. When you switch to Cura’s highest detail setting, the printer it has the potential to achieve a layer height of 0.18mm. This might be more than sufficient for classroom use. If you have a short amount of time, you can switch over to the optimal setting that will reduce layer height but speed up the printing process to around 3 times, compared to when high quality is turned on. Lulzbot gives you an all-around printer here with the TAZ6. Not only can you have fully automated 3D printing sessions but also can switch over to the advanced settings menu. High school and college students may use this printer to better prepare themselves for the workforce. Both basic and advanced settings may serve them well. When you unbox the Monoprice Select Mini V2 for the first time, it might impress you a lot by its steady build. The moving parts of the printer are hidden well. Therefore, you shouldn’t be concerned about a finger possibly getting injured. This printer sports an LCD screen on the front. You’ll get useful information like print progress and the general health of the printer on the screen. You can also navigate to files through the LCD screen. The LCD screen is not a touchscreen. There is a click wheel for navigating on the LCD screen. The click wheel on the printer makes it ideal for classrooms rather than a touchscreen because the latter is more susceptible to damage than the former. Although the printer comes fully assembled, you will still have to manually calibrate the printing bed. The calibration is not a difficult process but requires you to be precise. If you get it wrong, you might have many failed builds. Simply follow the included instructions and you should be all fine. This is a great printer in terms of reliability. In case you encounter any problems, you can jump onto one of the forums to get a quick fix. Monoprice staff also write on these forums from time to time. You will have to use CURA for all your printer software needs. Monoprice has become reputable over the past few years when it comes to their print quality. Like with most other Monoprice products, you’ll get exceptionally detailed models. There is no restriction on the software and filament that you can use with the printer. Therefore, you’ll have freedom to print whatever you like. There is no cheap 3D printer on the market that delivers quality prints. Monoprice outshines most of their rivals with the Select Mini. This is a classroom’s first choice if you are on a budget. Moreover, with the low price of the printer, you can purchase several machines to make a small production line of 3d printers.